Water-melons increase the body’s arginine, an amino acid that relaxes the blood vessels, increases blood flow to the heart, and helps men with erectile dysfunction. 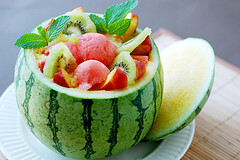 Water-melon is rich in the B vitamins necessary for energy production. A whole cup of water-melon contains only 48 calories, it delivers more nutrients per calorie-an which is an outstanding health benefit! Water-melons are made up of 92% pure alkaline water, which makes them safe for the stomach and a good alternative drink. They have health benefits for the whole digestive tract — the mouth, esophagus, stomach, and intestines. Examples are: they can relieve the pain of mouth sores and minimize bad breath. They can treat constipation and normalize bowel movement. 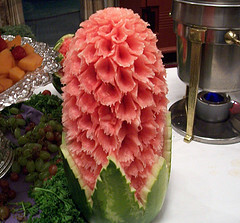 Good for the kidneys, bladder, and those with gout; water-melons are effective for cleansing the kidneys and bladder. WaterMelon for : Mouth Ulcer? 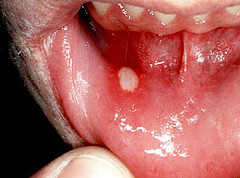 Canker Sore?